Prince T'Challa returns home after the death of his father to officially become the king of Wakanda. Meanwhile, Erik Killmonger and Ulysses Klaue hatch a plan to steal Wakandan vibranium and sell it on the black market, but one of them may have a grander scheme in the works. We are now 18 movies into the Marvel Cinematic Universe, and if "Black Panther" is any indication of what's to come for the rest of this universe, it's in pretty damn good shape. "Black Panther" is directed by Ryan Coogler. We loved his other directorial efforts "Creed," and "Fruitvale Station." Coogler also helped write this movie's screenplay with Joe Robert Cole. The film is based on a comic book series by Stan Lee and Jack Kirby. It stars Chadwick Boseman reprising his role as T'Challa, aka The Black Panther. After the death of his father T'Chaka, T'Challa is heir to the throne and will soon be crowned king of Wakanda. Once he becomes the king, he must defend Wakanda and its population. As the Black Panther, however, T'Challa must protect his people and keep the country's most precious resource, vibranium, from falling into the wrong hands. Meanwhile, arms dealer Ulysses Klaue (Andy Serkis) teams up with the military trained Erik Killmonger (Michael B. Jordan) to steal some vibranium and sell it on the black market, though one of them may have the long game in mind. With the help of his personal bodyguard Okoye (Danai Gurira), a Wakandan spy named Nakia (Lupita Nyong'o), and his tech-wiz sister Shuri (Letitia Wright), T'Challa hopes to end whatever scheme Klaue and Killmonger have hatched, and also must defend the country's valuable supply vibranium from any invaders. This film deals with complex political ideals of isolationism versus duty to the global community. T'Challa as a character has a very good arc in that aspect as his views on the situation evolve over the course of the film, as do his views towards what he thought to be the truth. He discovers that good and evil, right and wrong, are not always so black and white and that the line between the two is a very blurry one. The turmoil in "Black Panther" is far more intimate than it has been in any of the past MCU films. It isn't a case of "if I fail, the entirety of mankind will be wiped out." It means "failure now means bigger problems later down the line." The situation and the anger here are far more personal to all of the characters involved. One of the bigger problems comic book movies have faced in the past is failing to properly develop each villain. We have seen this issue in the Marvel Cinematic Universe, we have seen it in the DC Extended Universe, and we have seen it in the Fox and Sony properties as well. Luckily, "Black Panther" does not have that problem. Killmonger is one of the most well-developed villains in the MCU. He is a fully fleshed out character, and we understand his motivations and can even sympathize with them at times. The acting is great across the board. We have always been big fans of Chadwick Boseman, Michael B. Jordan, Lupita Nyong'o, Danai Gurira, Andy Serkis, and Martin Freeman for a long time, and they are all wonderful in their respective roles. T'Challa is powerful, tough, smart, and always tries to do what is right for his people and his country. Killmonger is an excellent villain who threatens to burn it all down. Oyoke is fierce, strong, and loyal to her country. Nakia is badass, empowered, and still vulnerable when she needs to be. Klaue...C'mon, is there anyone better than Andy Serkis to play an unhinged maniac arms dealer? Though all of these characters are enjoyable, it's Letitia Wright's character Shuri who really stole the show for us. Talk about brilliant! She's funny and a smartass, wise beyond her years, and is an excellent "sidekick" that we hope to see more of in the future. Now, "Black Panther" does have a few problems as some of the CGI, especially in the climactic showdown, becomes a little too video game-like. We must admit, it was a little distracting. Also, we felt there were a couple of pacing issues early on in the film as characters and situations are being set up. It isn't until Killmonger finally shows up that the story really gets going. Still, these are still minor complaints. "Black Panther" is another wonderful addition to the MCU. It is its own separate entity but fully combines with the rest of the cinematic universe and will take us right into "Infinity Wars." 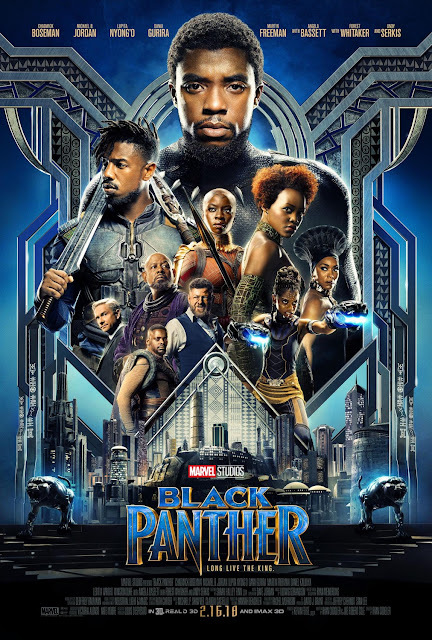 Ryan Coogler did an incredible job directing this movie. Rachel Morrison's gorgeous, striking cinematography makes it even more compelling. The costume design by Ruth Carter is colorful, iconic, authentic, and brimming with culture. If Marvel keeps churning out quality like this, they have very little to worry about moving forward.